Don’t Wanna Do Your Homework? Do you ever have the strong, stubborn feeling that you just DON’T wanna do your homework? In a client session recently, a junior in high school reported in that she just couldn’t motivate herself to get her work done over the past weekend. When I questioned her about what was in the way of taking action (I have a checklist I use to help students identify what’s going on when motivation flags), she pinpointed her “mindset” as the problem. So, I helped her investigate how she might shift her mindset to take quicker action in the future. In the last week of September, I was talking with one of my clients, she’s a junior in a very rigorous high school, and she said that this was the first weekend she just didn’t want to do her homework. So we did a little investigating about what was going on in her brain that was making it so hard for her to take action on her homework. First, we investigated the idea of “I don’t wanna”, but I put “because” after that in order to see the beliefs behind the strong stubborn feeling of “I don’t wanna”. As a result, we came up with a list of beliefs that she had that were holding her back. So the first was that there was too much homework, the second that it was too hard, and the third was that she didn’t know what to do. Once we had this list, we asked, a couple of questions of each belief. First, we asked, “is it true?” and as we were discussing it, my client said, “You know, there really wasn’t too much once I looked at it, but I hadn’t looked at it when I had this belief, so I just was convinced in my mind that there’s too much.” So in this case, asking “Is it true?” and then checking to make sure that’s actually the case, can help you overcome this belief. Similarly, the belief “it’s too hard” she couldn’t know if it was true as she hadn’t started yet, so once she started she realized it wasn’t, and if she first checked she’d have seen that it wasn’t too hard. Had the homework actually been too much, or too hard, she could have then asked herself, “What’s the next small action I can take?”. 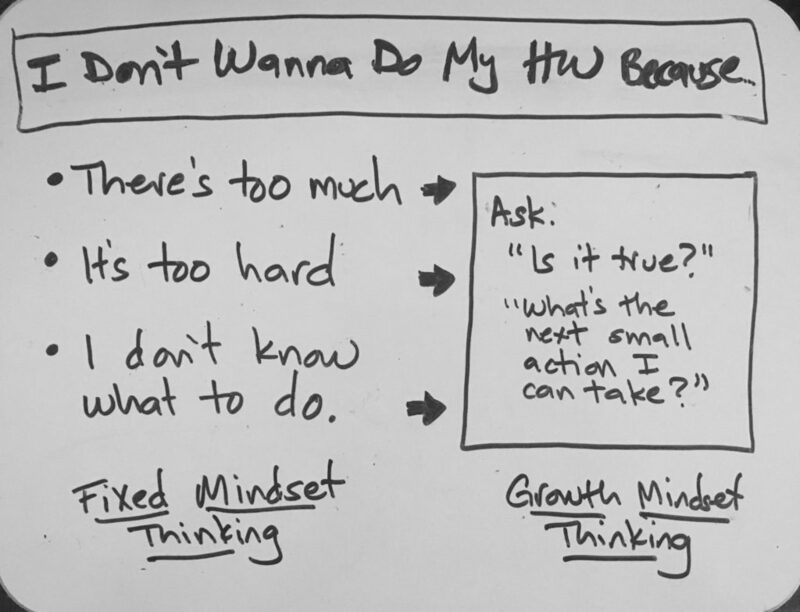 Now, the reason these questions can help you shift your mindset and allow you to take action is that the statements, the beliefs, on the left of the image are what’s known as fixed mindset thinking. These are items that come from a place in the brain where we think that it’s always this way, this is the truth, the truth doesn’t change, and everything is locked in place. On the other side though, we have growth mindset thinking, which is based on the fact that our brains can be changed over time through practice. And if you feel like you want more help getting or keeping yourself motivated and on track, please consider checking out my course, The Anti-Boring Approach to Powerful Studying™. Hey, thanks for sharing this. Great little tips for students and teachers in this video! I will definitely use this with some of my students who avoid their work, homework and in class. I have already even used it for myself since I’ve been dragging my heels on writing for National Board Certification for Teachers. Your video made me question why I am dragging my heels: feeling a little imposter syndrome, question if this is true: definitely not, and determining my next step: setting an appointment with myself to sit down and write! Thanks, Gretchen!